There are many primitive reflexes that develop during your childhood which can be influencing your posture and movement efficiency as an adult. In many cases, if these reflexes aren’t integrated properly in your childhood it can cause injury and pain from faulty movement patterns later in life. As Exercise Physiologists and movement specialists, we test and consider these reflexes in the design of an exercise program to ensure you optimize your strength and results from exercise. As such, training your nervous system to move correctly and efficiently is an important aspect of exercise at Inspire Fitness for Wellbeing. One such primitive reflex effecting your movement efficiency is the Asymmetrical tonic reflex (ATNR). The following articles overviews this reflex and explains the role it plays in development of correct movement; and the prevention of injury. What is the Asymmetrical Tonic Reflex? The Asymmetrical tonic reflex (ATNR) is a primitive reflex that is observed in new born babies, this normally vanishes once the baby is 6 months old . 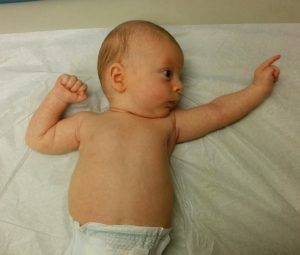 It is first seen within the first 3 months after birth and is more commonly known as the fencing reflex, this is due to the position of the infant’s limbs as seen below in figure 1 . Figure 1: Demonstration of the Asymmetrical tonic reflex . The main purpose of the ATNR is to stimulate the development of vestibular system and muscle tone whilst the baby in the womb, this typically starts occurring at the 18 week mark . In more simplified terms the ATNR assist with visual and auditory progressing that in turn help with early hand-eye coordination . For example, with the ATNR when the baby turns their head to the right, their right arm extends while their left arm bends into the ‘fencing’ position . During this movement when the baby extends their arm the baby follows the movement of the arm, this is turn makes the baby aware of their hand is part of their own body . The reason this reflex is developed in the womb, is because this ‘fencing’ position allows the baby to ‘corkscrew’ down the birthing passage during labour, in turn assisting the mother . The vestibular system is located in the inner ear and is involved in balance, it detects changes of position of the head by determining if the head is upright or not . This is important because if this system is not working the baby may have delays in the development of muscle tone due to having issues detecting change in body position . Once the infant has reached 6 months of age the ATNR becomes inhibited due to the muscles in the neck growing stronger, this results in increased head control as well as brain development in the cortex . This allows the baby to place objects in their mouth to learn about textures, prior to inhibiting ATNR the baby could not bring their hand to their mouth if the head was turned to the same side . What Impact does a Retained ATNR have? While the ATNR is essential for the first 6 months of child’s life, if the reflex is retained this can have detrimental effects on the child’s future motor patterns . One of the main effects of a retained ATNR is poor eye tracking, especially when it comes to crossing the visual midline . Imagine you have an imaginary midline from the top of your head to your toes, when you read your eyes need to track and read the words from one side to the other and therefore has to cross your imaginary midline. When you go to pick up a book from the left-hand side of the shelf and move it to the right, you have to take your arm across this midline. If you are unable to cross your imaginary midline it causes the body to stop or skip when you’ve reached your midline. What this means is you lose your place every time you reach your midline. For this reason, those with a retained ATNR often have difficulty with learning to read, write and hand-eye coordination . A retained ATNR also prevents the child from developing cross pattern movements such as crawling, rolling over, as well as walking by using alternative leg and arm . This in turn has been found to lead to the children having atypical motor patterns such a drawing circles backwards, as well as being single handed in majority of activities . Balance is also affected due to the child struggling to look from left to right, this results in uncoordinated movements during walking or running as well as difficulty with symmetrical movements of both their hands and feet . What is the Relevance to Sport and day-to-day Motor Patterns? While all this is quite interesting, the next question you might be thinking is if there are any cases of this reflex still being present in adults and what impact that might have? While the research is quite scarce and still growing in this area, the short answer is yes. One study conducted by Bruijn et al. asked healthy adults to sit on their hands and knees while their head was rotated either left or right by the experimenter and the movement of the subjects limbs were measured to determine if any detection of the ATNR could be registered . What they found was elbow angle had a movement of 8 degrees due to the head movement and they found this was consistent with multiple trials, indicating the movement pattern of a typical ATNR . The studied suggested that the explanation of this movement most likely would have to do to the slight suppression of the primitive ATNR, indicating that it is still retained. While a small change in movement pattern may not seem so significant, hand-eye coordination, balance and symmetry with feet and hand movement are essential for day to day tasks. For example, if an athlete has difficulty tracking the ball this could cause an increase in injury or could have an effect on the game performance. Another example, is If while driving you couldn’t scan what is in front without stopping at your midline you could potentially be a danger on the road. A Possible link to Chronic Lower Back Pain? Not only can a retained ATNR affect sport and day to day motor patterns but a link between chronic lower back pain (CLBP) and ATNR has been observed with a high number of CLBP containing a sensory deficit associated with ATNR . Up to 80% of CLBP have an unknown origin, and one of the proposed theories to explain CLBP is an altered neuromuscular control of the spine . Often what they find with CLBP are the superficial muscles have an increase in activity while the deep muscles are impaired . One study conducted by Gibson 2014, looked at comparing the activation of rectus abdominis (RA), external obliques (EO), and internal obliques (IO) of CLBP during the hollowing manoeuvre . The hollowing manoeuvre is when one pulls their belly button inwards and upwards towards their spine . What they found was CLBP individuals had an altered activation pattern of abdominal muscles (RA greater than OA) during the hollowing manoeuvre compare to the healthy control group, as well as altering head orientation had a substantial effect on RA activation . In the article Gibson discusses that a possible explanation as to why a retained primitive reflex such as ATNR may be present in CLBP patients, is due to the atrophy of the central nervous system grey matter . This atrophy is often associated with CLBP and could lead to the reduction in inhibition to the ATNR, resulting in the resurfacing of the primitive reflex . If this were the case this in turn could possible explain why some had difficulty with the hollowing manoeuvre, due to the primitive reflex leading to altered motor strategy. This area still needs more research to determine the exact nature of the relationship between CLBP and primitive reflexes such as ATNR. While the research in this area is still growing it is interesting to observe how a little change in a reflex that is essential as a baby could have detrimental affects as an adult.